This should sound like familiar advice by now: it’s a point I try to make often here on the blog! 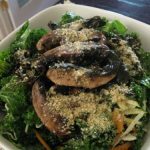 But it’s worth repeating, if only to persuade you all that eating raw foods–either frequently or once in a blue moon–shouldn’t be too demanding. It should be fun, simple, and refreshing. 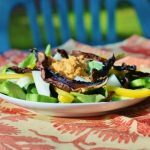 Most of all, it shouldn’t feel overly foreign; the key to transitioning into plant based foods (raw and cooked) is to evoke the qualities you’ve always loved in omnivorous cuisine, but with a herbivorous twist. This “steak and potatoes” dinner is a perfect example of how simple it is for the newbie raw chef to bring to life some of the textures and tastes we associate with cooked food. It calls for easily obtained ingredients, and it takes no more than fifteen minutes of active prep time. I served the dish with some lightly steamed broccoli (which you could certainly top with some of Sunday’s delicious cheese sauce), and I highly recommend you do the same! Submerge 4 Portobello caps in the marinade. 1 hour will be enough for them to be ready, but overnight in the fridge is even better. Place cashews and salt in a food processor, and process into a fine powder. Next, and the miso, lemon juice, pepper and cauliflower. Pulse to combine. With the motor of the machine running, add water in a thin stream, until the mixture begins to take on a smooth, whipped texture. You may need to stop frequently to clean the sides of the bowl and help it along. When it’s to your liking, stop, scoop, and serve the mash alongside a Portobello cap and, if desired, some steamed broccoli. There you have it, guys: a hearty dinner that’s ready in no time. Perhaps this is a candidate for tomorrow’s Raw Wednesday? I know I haven’t always been able to remind you guys of the Raw Wednesday tradition, or to post photos on time, but I do still encourage you all to celebrate it and send me feedback: I’ll get to photos at some point! Also remember to check out Katie’s Vegan Thursday challenge. On that note, it’s back to work I go. Have a great afternoon. Raw Wednesday! I’m planning to celebrate in style: with raw macaroons :). And maybe some of your cauliflower mash, if I can get to the store in time to buy miso. Love you bunches (of kale)! This looks so good! I almost just ran to the store to buy portabello mushrooms, and then I remembered I can’t have them on this phase of my elimination diet. Oh well. Guess this one will have to wait. But I will definitely be making it! Hi there Gena! I love your site. What a great wealth of information even for people like me who aren’t ready to give up cooked foods but want to try eating more raw. Thank you! I just recently found your site, though, so I’m not caught up with everything. What is the Vegan Thursday Challenge? LOVE that meal! we had a version of that at 105degrees and it was sooo tasty 🙂 i’m excited to try your version! wishing i would have done the raw cleanse. i’ve been eating a ton of cooked food and animal protein lately.. i’m feeling a little sluggish over here! Following your simplistic approach to raw has helped me SO SO SO much, that I can’t even begin to express it here. I definitely was once that person who said “I could never go raw, because it would be way too expensive, time-consuming, and boring.” Well I have you to thank, for changing my inaccurate belief! And now I’m super excited to try these recipes out on my family. I’ve made them mashed cauli before and they love it, but I’ve never made a nut based version (do you think I could sub almonds or brazil nuts for the cashews?). Glad to hear the Spark Wellness is going well! This looks delicious! I am going to try those “mashed potatoes” soon! Thanks! That looks so good!! I am totally trying that marinade on our mushrooms!! Looks like your raw version of mashed ‘taters would be safe for the cleanse! I am going to have try whip up a batch pronto. Yum! That mushroom cap looks a bit like this meatloaf softball we saw in the hot deli case at Whole Foods the other day. Pea Daddy asked how much he would have to pay me to eat it. I decided on $500.00. I’m now thinking that was too low. Good god no! This serves 4 steaks, and the mash serves 6 comfortably. I’ll edit the post to point that out. Thanks for the reply, Gena. I often wonder how many nuts people can deal with, and whether it’s just me that has to limit them quite severely. My main fat source seems to be tahini or avocado rather than nuts. This looks so good that I swear my mouth is watering just thinking about it!! 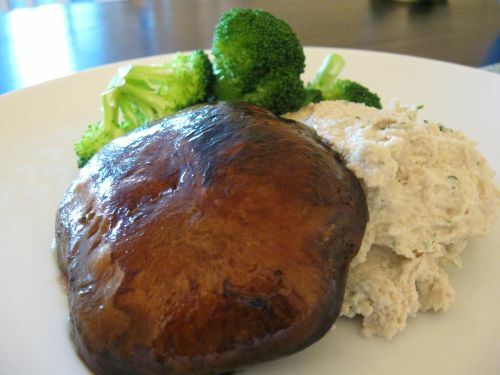 Portobellos are so delicious… I’m definitely making this one! Oh sorry! I didn’t see that there was a link there. Please ignore my earlier comment and question. I feel like such a dork! This is such a cute idea! And it looks awesome! Wow – that looks so authentic! Fun! Oh Gena, great work my friend!!!!!!! I love Cauli and Cashews, so that’s right up my alley and the p’bellos. NICE! The flavors in the marinade just would rock…maple with nama with balsalmic. SO good. Can’t wait to try this on the meat and potatoes loving kinda people for dinner parties and such! I’m tempted to give this a try. Do kids take to it well? Will search your site more for tips and recipes. Hey Andy! Kids should love it! hi Gena! I love reading your blog and am excited to try out this recipe. i also have a random question for you, hope you don’t mind! I’m looking to get a new thermos as I love carrying hot tea with me to class, especially in this gloomy Northeast weather, but I’ve heard many water bottles have leaching issues amongst other things. I was wondering if you have any suggestion for an environmentally and health safe thermos. much thanks! Cool idea! This is great for newbies who miss those old dishes. And what a creative idea! I have been doing recaps of my day for the past two day on my blog… if you get a chance take a look. Hi Gena! that looks sooo good, but is there any way to warm it up? i don’t think i could eat “steak” cold! You could go ahead and bake or grill the mushroom — that’s no big deal! And you can gently warm the mash in the oven, too, OR used steamed cauliflower. Gena, How do you think the cauliflower would work in a vita-mix? it all looks so yummy! It’ll work in a Vita, but you’ll need some extra liquid to get it moving, so it may not be quite as thick as this version. Good luck! Wow, beautiful AND simple for raw food? Awesome. Fantabulous work, Gena! Can’t wait to try this meal!!!! I’ve let my VegNews subscription lapse (bad, bad me!) so didn’t see your column–congratulations!! Wonderful news. 🙂 And this recipe looks stellar. I must try that mash! I love it! Just a few easy to find ingredients, quick to prepare, and hearty home style comfort food. Thank you! 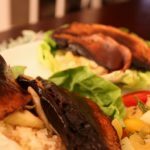 Oh wow and I just happen to have a huge, fresh Portobello mushroom and all the marinade ingredients – should make a great lunch tomorrow. Thanks! I’ll have to give this a try! I’m kind of obsessed with blending boiled veggies and raw nuts/seeds together- I should try it raw again. I also don’t think I have ever marinated anything- it’ll be a first! see this is why eating raw or vegan seems so ineresting and delicious! this idea is so killer. thanks gena! Thanks for the wonderful blog! It’s one of my favorite raw blogs and I like your balanced style. 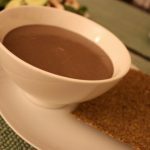 Could you write about how you come up with recipes to post on here? Whoa! This even looks like “the real deal.” Looooooves me some portobellos. Nice marinade! yum!! haha so neat. i think my favorite thing on that plate is the broccoli, but I would LOVE to try mashed cauliflower or faux mashed taters!! This looked fantastic in VegNews, but for some reason, I think this looks even better now all huge on my computer screen. 🙂 I am making this for dinner tomorrow! I must. im a mushroom lover but have never marinated them and love this idea!! thanks for the recipe! LOVE portabellos they are so meaty and hold up so well with anything you can even grill them! they are delish! such a creative twist on a meaty classic! That is one of the best things about your awesome site, Gena: you keep it simple! You make raw food so attainable and realistic, not to mention delicious. I love that! And I will be making this dish. Raw mashed potatoes? YUM! I really want to try this recipe! Especially the mashed potatoes! I miss potatoes! Im actually a fashion blogger and am new to your blog (although have been a follower for some time! )…but had to comment on this post as I went raw three years ago after suffering from anorexia since age 12. I can honestly say going Raw saved my life and I dont know where Id be today without it. Im loving your recipes! Keep them coming. That cauliflower mash looks amazing! I had no idea you could make raw mashed cauliflower… this is definitely getting tested this weekend, thanks for the recipe! 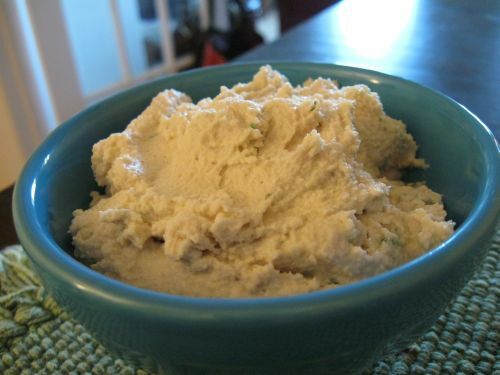 That cashew cauliflower mash sounds delish! 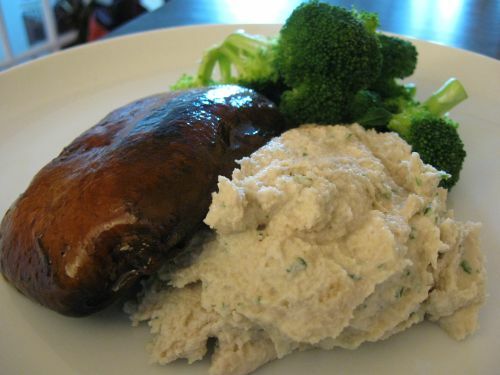 Gina, what a fabulous looking dish – Have you made “mashed taters” with jicama? It’s superb! I love your approach to raw food! Wow, it is scary how real your faux-cipes look! amazing girl. I’m just coming back from the market ready to get started on this dish for tonight. Do you clean the gills of the mushrooms? I’m allergic to soy and suggestions on a substitute for the nama shoyu? I made it and this was delish!!!! I will be making it often.Thank you for the great idea and recipes. I made a very similar mash!!! Once with regular potatoes and a cashew cream + chives + s&p. I also made one with sweet potato + cashew cream + chipotle + s&p. I used butter for both of them as well but I bet coconut butter would be incredible!! Tried this last night and loved it! It was so good. My youngest devoured the cauliflower mash. Hello Gena.This is my very first comment(I’ve only just recently discovered your blog).I was wondering if almonds couldn’t replace the cashews since I’m not exactly a fan of the latter(it seems to me me that regardless of how much salt I use,they still taste too sweet).Thank you! Classics never get old and steak and potatoes is no different. Has anyone tried this with no miso? Im not a fan of it, and would like to omit, or substitute, but with what? Any suggestions? Thanks. But I wonder why you use maple syrup and balsamic vinegar when they are clearly not raw. It puzzles me that some people in the raw community use these ingredients. Why not use ANYTHING cooked then? Where do you draw the line? I am wondering about the olive oil… where does it goes? after getting cashews to fine powder…add the rest ? I did not see oil mentioned. only in the list of ingredients.